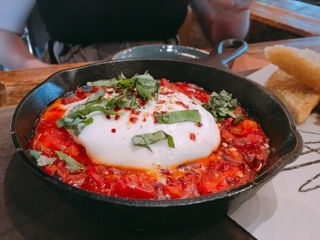 Scaddabush brings together fresh cooking with the benefits of being a chain: their ample dining rooms makes securing a reservation easy and with their huge Nonna’s table can accommodate large groups. 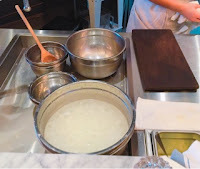 Yet, the restaurant relies on their chefs to make most ingredients in-house and employees are considered artisans, encouraged to add their personal mark (as shown by the symbol on the platter above). Indeed, nothing will be fresher than the house-made mozzarella. Only served between 5pm – 11pm, each dish is hand-stretched to order using cheese secured from a local Mississauga dairy. 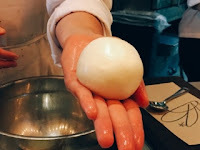 If you’re interested in watching your dish being made, you can ask to be brought over to the mozzarella bar where the chef submerges the cheese in extremely hot water so that it’s pliable, stretches it just enough for elasticity, and forms it into a delicious sphere. The naked ($12.98) is for the purist, simply adorned with a splash of olive oil and San Marzano tomato jam and sea salt on the side. Unlike burrata it’s not overly soft; instead, the cheese has a springy bite. With a sprinkle of salt, it worked well to enhance the rich creamy flavour of the mozzarella. 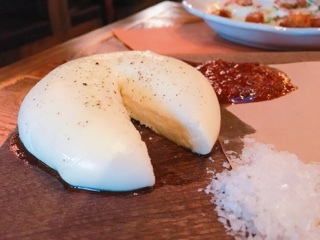 If you prefer the cheese melted, the bomba burrata ($15.93) takes the mozzarella and adds cream to make it softer. Served in a hot cast iron pan, the cheese remains gooey in the spicy roasted tomato ragu that’s studded with plenty of double-smoked bacon, basil and chili flakes. I found the bacon’s strong flavour took away from the milder cheese. But, the sauce is fantastic and you’ll definitely want to sop it up with the focaccia crostini. I love the spiciness of the ragu and even added it to some of the other dishes that evening. Italians make amazing polenta – especially when it’s deep fried. Even though the sauce was delicious, it should be served on the side as it renders half of the crispy tots ($8.97) soggy. 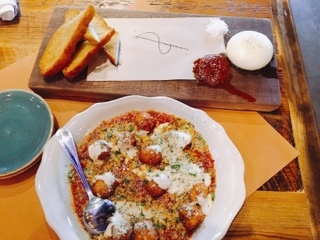 However, if you eat them quickly, the polenta with dollops of mascarpone, drizzles of parmesan aioli and shaved Grana Padano is delicious. Try some of the sauce on the naked mozzarella, they go well. 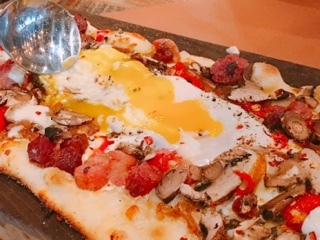 Scaddabush may be serving the ultimate hangover pizza: the smoked bacon and egg ($15.96), a thin well toasted crust smothered with toppings including mushrooms, caramelized onions, mozzarella and huge chunks of not overly salty double smoked bacon. It arrives with a fried egg that you’re encouraged to smear onto the pizza while still hot. Just be mindful of the spice - this is a spicy pizza with the chili oil and ample chopped bird’s eye chilies. A dish that Chef Steve Silvestro perfected is the Sunday sauce (a marinara amped with pancetta and spices) and the braised meatballs – dishes he would cook with his Nonna. 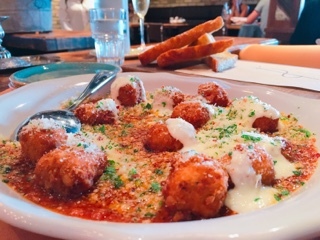 All that practice is now showcased in the restaurant’s ½ lb meatballs made with ground angus chuck, ricotta, parsley, garlic, black pepper and porcini. They’re available by itself as an appetizer ($12.98 in classic style of $13.58 stuffed with cheese) or as a family-style sharing plate with spaghetti ($17.97 for the classic of $32.35 stuffed). Despite being such a huge hunk of beef, the meatballs are surprisingly light and moist thanks to the ricotta. 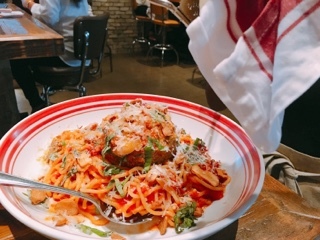 The house-made spaghetti is thick and chewy, almost like a thinner bigoli, and goes well with the Sunday sauce. I’d only make one change: the dish could have had less garlic chips given they’re so strong. Trust me, their desserts should be shared. 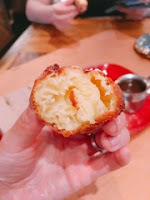 Half a dozen sweet airy zeppole ($6.50) arrive in the order, piping hot and dusted with citrus sugar. 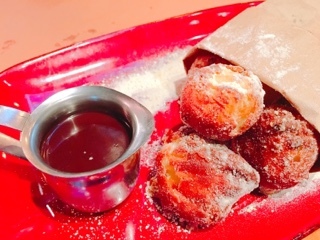 The warmed chocolate hazelnut sauce is great for pouring into the spongy fried dough after the first bite. If you’re a fan of beignets you’ll love these! 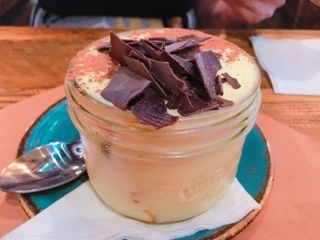 The tiramisu ($8.25) is rich with the mascarpone cream. Just swivel the jar around as you share to ensure everyone gets a taste of the espresso and marsala soaked lady fingers. I would have liked more of the cookies to help balance the sweet thick cream. Scaddabush is inspired by Italian passion and generosity. So, they believe in giving back and patrons help by purchasing their charity bread (ranging from $4.25 - $5.25 depending of flavour). Each restaurant selects a local charity to donate the proceeds of the bread to - for the Scarborough location it’s the Bluffs Food Bank, an organization that helps provide 350 families with groceries weekly. I like the fact that each restaurant’s anniversary is celebrated by giving donating the charity bread proceeds. Since the first restaurant launched in 2013, Scaddabush has donated $60,000 to Sick Kids and Mississauga Food Bank collectively. This fall, Starlight Children’s Foundation will receive their cheque when the Richmond Hill location turns one. What a great initiative and the perfect way for me to consume more carbs, guilt free.